A few weeks ago, my bridesmaids hosted the most amazing bridal shower for me at The Basics (my fave!). The food and the company were both wonderful and i'm still holding onto the excitement from utilizing all the new kitchen gadgets i'm starting to aquire from my registry. One of my favorite gifts was a 6 quart crock pot. When I saw the size of that crock pot I thought to myself, "I could put a whole chicken in this thing!" And guys, that's exactly what I did. I think you all know by now i'm a huge fan of a simple roasted chicken. There's just something so warm and comforting about it. Unfortunately with the weather getting chillier and the days shorter, I barely seem to have the stamina to make it through an 8 hour work day, let alone wait 2 hours for a chicken to roast. This chicken, however, is ready and waiting for you when you get home at night. It's moist, flavorful, and falls right off the bone. What could be better? Remove the giblets from the chicken. Pat the chicken dry with a paper towel, then place the lemon and garlic cloves inside the chicken and place the chicken in the crock pot. Spray the chicken with cooking spray, season liberally with salt, pepper, and herbs de provence. Cook on low heat for 8 hours, or up to 10 hours. Enjoy! That sounds so good! 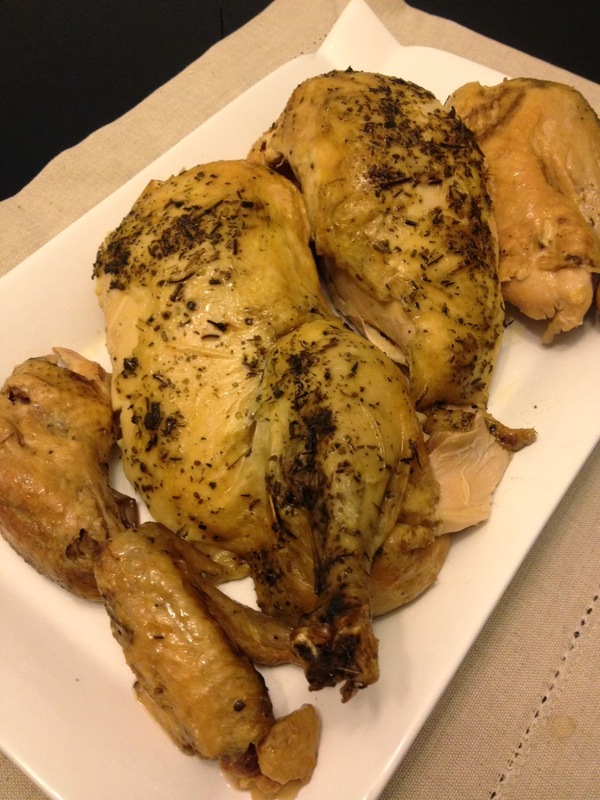 I love simple roasted chicken. Plus, the pieces you don't finish turn into the most delicious leftovers.